The gas props do not/never have helped lift bed. In looking at the mounting, it appears there is no compression of the pistons when the bed is down. Have removed and tested both 100# props and they have plenty of force, so I'm thinking the mounting is incorrect. With the bed fully up it is 14 inches from the hinge to the top mount point and 30 inches from the hinge to the bottom mount point - the uncompressed props are 19.5 inches long. Would some kind soul please describe and measure their props mounts and posts. Pictures would be nice too. It's hard to say whether or not your springs are bad or not. I've refurbished old stuff before requiring these and have come to summation... they do wear out over time and if they're used alot. If they're not doing their job they're either bad springs, or over loaded. I deal with something much older in my 92 model but it sounds as if the gas springs are the same specs used in both of our campers. I did measurements about a week and a half ago having the same problems you're facing. I have 2 springs, one the head end and one on the foot end of my bed with the lift coming from the side of the bed. My measurements for the springs were a fully extended 20.5" with a 6" stroke. I'm not positive of the exact reference point to measure and just wanted a rough estimate. 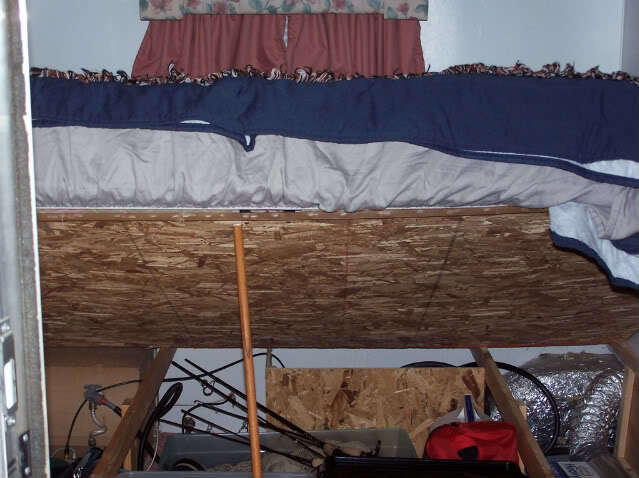 Currently, if the bed is without linens the springs do their job and hold the matress and lid up, with the bed made it's a different story, there's too much weight. I just use a wooden dowel rod to prop it up for the time being. My solution comes with upgrading my bed to a more comfortable pillow top queen we have and ditch the thick 'matress like' thing that's there now. The new mattress weight is alot heavier. I'm going to get 3 new matching gas springs in when I do the bed upgrade. I also need 2 spec'd for my dinette underseat storage lids. I'm going to add a couple nylon pulls with button snaps to the bed to make sure that it stays down during travel just to be safe. I've found this place has a ton of misc specialty hardware for my shop projects. It's easy to search their inventory for the spring with the specs to fit your need. 3 of these will suit my new heavier bed. I hope this helps out to getting you fixed up. 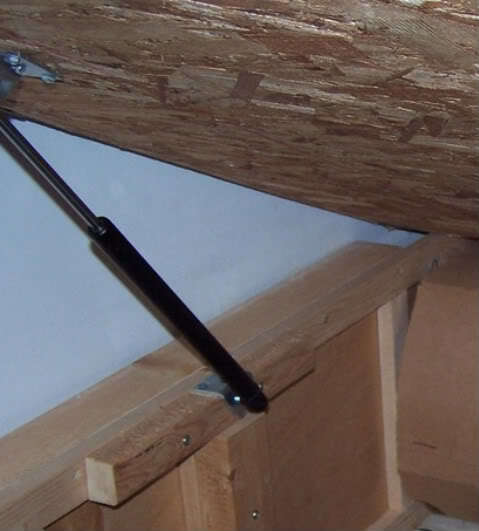 ps... as I reread your post, remember these are 'fixed force' springs and aren't designed to do the all lifting of their spec'd support weight(they do help out), they just hold the weight upon extension once it's gotten lift assistance when you pull to open your storage. While I didn't take any measurements, my '98 was just the same. The gas shocks and even the way they're mounted are exactly the same. If I recall, it's the same in the 286, but I haven't looked at it close enough to see. In that, only the front half of the top opens. Many thanks for your reply and pictures. Based on rough measurement on your picture, I concluded the props were incorrectly installed. I moved both the upper and lower brackets to produce more compression. Now the bed is easily lifted. I'm surprised that's the case but I guess there's bound to be some construction flaws along the lines from time to time... probably someone's 1st day on the job at the sunline factory. At any rate, I'm glad you've gotten them reinstalled correctly and everything's working as intended.